Notes: ‘Commodities’ include products of the agricultural, forestry, fisheries/aquaculture and mining sectors. ‘Developing countries’ include non-high-income countries as defined by the World Bank, excluding countries in East and Southeast Asia, which tend to participate in regional manufacturing supply chains. Trade data is from CEPII BACI. 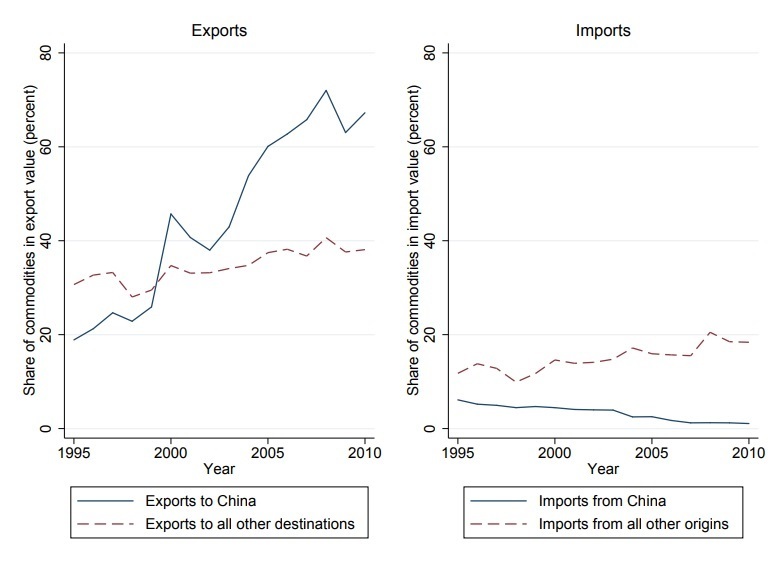 In 1995, commodities made up only 20% of these countries’ rather limited exports to China. 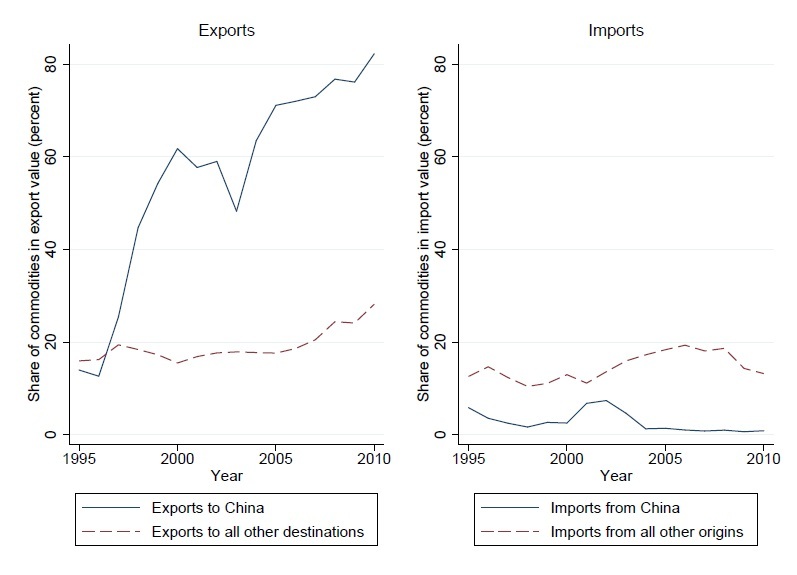 But by 2010, nearly 70% of exports to China from developing countries were commodities (Figure 1A). Meanwhile, these countries’ rapidly growing imports from China consisted almost entirely of manufactured goods (Figure 1B). This swift transition to a new kind of trade relationship has sometimes been unpopular with China’s trade partners. For example, before a visit to China in 2011, Brazil’s former president Dilma Rousseff promised that she would be “working to promote Brazilian products other than basic commodities”, amid worries about “overreliance on exports of basic items such as iron ore and soy” (Los Angeles Times). So for countries like Brazil, how did the benefits from the China-driven commodity boom compare to the costs of rising competition from Chinese manufactures? Notes: ‘Commodities’ include products of the agricultural, forestry, fisheries/aquaculture and mining sectors. Trade data is from CEPII BACI.